When the first iPhone launched, I wasn't old enough to be privy to the kind of conversations people had about Apple's first smartphone. But it was a different story in 2014 when 'one more thing' flashed up on a big screen behind Tim Cook, and the Apple CEO stepped aside to let a video play and unveil to the world the thing we'd all been calling the iWatch. There it was. A rectangular watch. The different coloured bands. A bloody Mickey Mouse watch face. The Apple Watch. Several weeks later I got my hands on the smartwatch (pre-Wareable days). And what I remember most about that time, after I'd cast my verdict on the Watch, are the messages that landed in my Facebook inbox asking me the same questions. "I've got an iPhone, should I get one?" and "Do I need an Apple Watch?" and "Hey mate, what do you reckon on the iWatch?" The response to those questions was the same. You don't need this in your life. Do not buy it. It's not there yet. I imagine the same things were said about the first iPhone. But just like Apple's first smartphone, things do invariably change and Apple moves quickly to address the features many were critical of. The battery life, the very un-Apple interface and a whole lot more. A few iterations down the line I can now say, you know what, I think you'll actually probably like this now. Three years on from when the first Apple Watch went on sale, I don't get those questions about the Watch any more, and I put that down to the fact that Apple is finally delivering what I'd hoped it would three years ago. A piece of technology that people have found a space for in their lives. A lot has had to happen to get to that point where I can sit down on a train and see multiple black rectangular screens peeking out of shirt sleeves, or I can turn on the TV and every single presenter is wearing one. Or it's being referenced in a TV show in the same way that every fitness tracker is always a Fitbit. 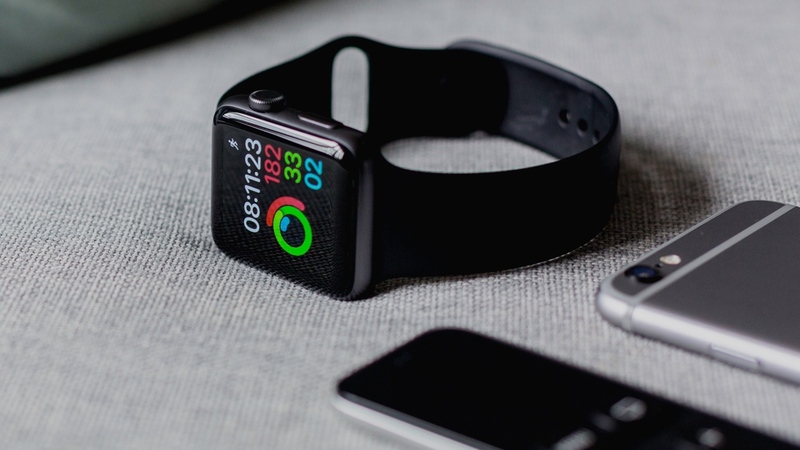 The shift from fashion to fitness still surprises me, but that original sense of styling and personalisation lives on in many ways through Apple's gorgeous bands and the raft of third party options that help make up the numbers. There's no getting away from the fact that the Apple Watch's design still divides people, but its ability to do a pretty solid (albeit not perfect) job of combining running watch, swimming wearable and fitness tracker proves that Apple's shift in thinking was the right one. Who would have thought that closing those Activity Rings would be so satisfying? And when we talk about those core features that we've come to expect all smartwatches to deliver, like notification support, music control or messaging, the Apple Watch is the one that we still measure all others against. Yes, Samsung, Fitbit, Garmin, and Google's Wear OS clan have shown their worth in these departments too, and in some aspects have bettered what Apple can do, but when it comes to offering the overall package, the Watch for me still comes out on top. We hear so many companies talk about the potential of its tech to be life changing, and while I'm not going to get carried away and say that the Apple Watch has achieved that, the stories of incidents where its smartwatch has come to the rescue are becoming more regular. There's the guy that realised he was suffering from a serious health condition through an Apple Watch app that detected his abnormal heart rate activity. Or the woman involved in an accident who couldn't reach for her phone but could activate the Emergency SOS feature from her Watch while trapped in the wreckage. This is a wearable that is saving lives, from the hardware that Apple built and the developers that have embraced that hardware – partly because there are simply so many of them out there on real wrists. With the future promising a bigger push into serious health tracking, it's already much more than a place to check the time and find out who's liked your Instagram post. I'll be the first to say that three years on, the Apple Watch is not perfect and anyone that owns a Series 3 will no doubt agree with me on that, but it's providing the most convincing argument that a smartwatch has finally gone beyond that gimmick phase. It's grown up and matured into something people want to wear and find the features useful day-to-day. Even with a Watch Series 4 in the offing, you won't feel shortchanged with the current Series 3 or even the Series 2. Apple is starting to achieve what it set out to do in wearable tech. I definitely couldn't say that back in 2014, but in 2018, it's a different story.